What the blurb says: “Northeast Mississippi, hill country, rugged and notorious for outlaws since the Civil War, where killings are as commonplace as in the Old West. To Quinn Colson, it’s home – but not the home he left when he went to Afghanistan. The Ranger is the first book in a new series featuring Quinn Colson, and was shortlisted for the prestigious Edgar Best Novel Award 2012. 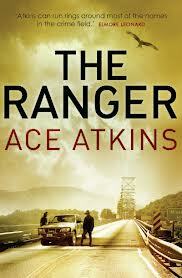 It’s the first of Ace Atkins’ books that I’ve read, and I have to say, I loved it. It’s a classic western re-imagined into contemporary life. Atkins builds a three dimensional world bursting with dynamic characters, like the brave Deputy, Lillie Virgil, who is determined to get to the bottom of what happened to the Sheriff, and showing modern challenges like property development in rural areas, the struggle of backwater towns as the wealth, and jobs, move to the cities, and the basic desire to protect family. Quinn is a modern twist on the archetypal lone ranger. A man of few words and great action, he lives by a strong moral compass and a determined streak to see things though. As the story progresses, Quinn discovers that the place he left behind when he become a Ranger has changed. Good and bad are no longer clear, and people he once respected have formed alliances with those more corrupt. When Quinn starts to uncover the truth he is warned off. He ignores the threats, and the uneasy tension builds until lawless violence erupts. It’s hard to write a review that doesn’t give away spoilers, but the showdown at the climax of the novel is spectacular and highly cinematic. If you’re a fan of action thrillers, this should definitely be on your reading list.